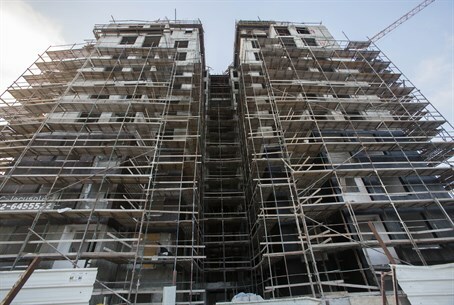 New home sales were down 10% in March, as Israelis were holding off on buying homes in the wake of a plan to cut VAT payments. New home sales were down 10% in March, as it appeared that Israelis were holding off on buying while the government formed legislation around Finance Minister Yair Lapid's plan to eliminate value-added tax (VAT) payments for first-time home buyers. Only 1,790 homes were sold in March, compared to 1,980 in March 2013. During the first quarter of 2014, sales were down 7% over the same period in 2013. Between January and March of 2014, a total of 5,720 homes were sold. According to Lapid's plan, value-added tax (VAT) would be eliminated for first-time apartment buyers. Families who get the discount would have to hold onto the apartment for at least five years. This measure is intended to prevent couples from buying apartments for the purpose of trading in them. VAT is currently 18%. Lapid's plan would provide the discount to Israelis who had at least one family member who served in the IDF. Along with slower sales, prices for homes have been falling as well, as buyers have been holding out for what they hope will be a better deal. As a result, builders are offering discounts of as much as 15% on new homes in many parts of the country. With buyers certain that the proposal will eventually become law, many have pulled back on plans to buy homes, real estate industry officials said – and for homes up to NIS 1.6 million ($460,000), considered as priced for middle-class buyers, sales have essentially dried up. Tzemach Hammerman, which has several projects in Beit Shemesh, for example, is offering an across the board 11% discount on homes priced from NIS 1.2 million to NIS 2.25 million. A builder in Yehud is offering for sale homes at an 18% discount – the same discount buyers would get with Lapid's legislation – and in Lod, prices on nearly all new homes are down an average of 15%. Sales are down even in generally popular areas, like Holon and Bat Yam, said industry officials, and builders there are open to negotiating deals with buyers.